Andrew Jackson Royal (1855–1894) – Though Sheriff A. J. Royal only served one term as Pecos County Sheriff, he made an unfortunate impact on Fort Stockton, Texas. He was born on November 25, 1855, to Ethel Joseph and Mary Frances Ousley Royal, in Lee County, Alabama, the only son in a family of five daughters. While still a young man, he headed west, landing in Fort Worth, where he went to work for the railroad. On January 19, 1879, he married Naomi Obedience Christmus in Coryell County, Texas and the couple would eventually have six daughters and one son. Shortly after his marriage, the couple moved to Junction, Texas, were Royal operated a ranch and a saloon. Several years later, after he was reportedly indicted for murder, he took his family to Pecos County in 1889. He soon established another ranch near Fort Stockton as well as a saloon located at Callaghan and Main Street. Called the Gray Mule Saloon, the building still stands in Fort Stockton today. A quarrelsome and intimidating man, Royal killed one of his employees after the two got into a dispute. 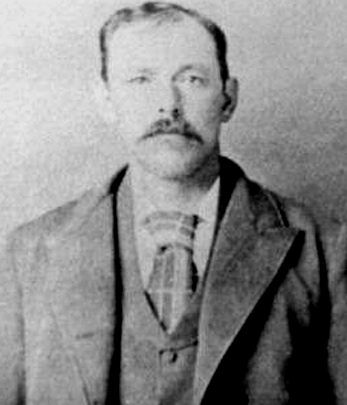 Despite the killing and his personality, Royal was elected Pecos County Sheriff in 1892. A controversial figure from the start, area citizens were initially split in their opinions. While some thought he was a tough lawman who worked hard to establish law and order, others thought he abused his power as sheriff, often terrorizing those who disagreed with him. During his short two-year term as sheriff, his time in the position was certainly not uneventful. One story tells of how he won the Koehler Saloon in a card game, but the owner died before signing it over. Another tale, which occurred in 1893, relates a story of a man who was accused of stealing a watermelon. As Royal was taking the man to jail, he tried to escape but, was quickly recaptured. After the thief spent three days in jail and was released, the sheriff and another man, most likely his infamous deputy, Barney Riggs, were said to have taken him outside of town where Royal horsewhipped him and told the man never to return to Pecos County. Royal got more aggressive and intimidating the longer he was in his sheriff’s role. He began making threats toward several leading citizens in the community including County Judge O.W. Williams; merchants, Frank and James Rooney; and County Clerk, W.P. Matthews. All these men had backed his opponent R.B. Neighbors in the 1892 election and were planning to back him again in the upcoming election to be held in October 1894. A.J. Royal once ran the Gray Mule Saloon, which still stands in Fort Stockton today. Photo by Kathy Weiser-Alexander, 2011. On August 4, 1894, while drinking in his saloon, he sent word to the two Rooney brothers and Matthews, who were in Koehler’s Store that he was going to “wipe them out.” The sheriff would later deny sending the message, but, it was confirmed that the threat was delivered. Later, the sheriff went to Koehler’s Store looking for the Rooney brothers, however, as he walked in with a cocked pistol he was spied by James Rooney, who was in a small room in adjoining the saloon. After Royal found no one in the store and turned to go back out, Rooney confronted him with a shotgun. The sheriff began to shoot and Rooney also fired, but, no one was hit and Royal fled. Royal then gathered up his deputies and some friends, who surrounded the store, threatening to burn it. The Rooney brothers and W.P. Matthews, who was also in the saloon, soon surrendered to Sheriff Royal, who arrested them and marched them to the Justice of the Peace for a preliminary examination. However, the three arrested men, sure they would not be guaranteed safety in the city court, waved the examination, stating they wished to appear before the grand jury. When the Grand Jury was formed the next month, most of its members were Royal’s friends. The jury issued numerous indictments on several people opposed to A.J. Royal including Judge O.W. Williams for not paying an occupation tax. They also indicted another man for “fornication,” but did not cite his partner, as she was also intimate with one of Royal’s hired men. They indicted the Rooneys, for charges that we were unable to determine. Obviously, all those indicted felt that there was no protection of the law in Pecos County. Sheriff Royal and his deputies wasted no time arresting those who been indicted and once they were behind bars, refused to accept bail. However, County Judge O.W. Williams issued a writ of Habeas Corpus and they were released. When Royal’s opponents continued to receive threats, it began to look as if the political dispute could erupt into an all-out “range feud.” Five men of Texas Rangers’ Company D were sent to town at the request of citizens because of the volatile, feuding atmosphere. Extremely unimpressed with Sheriff Royal, they soon advised Royal’s enemies to arm themselves. In the meantime, Royal and his deputies were using other tactics to secure his re-election. One such scheme was to allow a Mexican-American prisoner named Victor Ochoa to escape in exchange for making campaign speeches for Royal to Hispanic voters. 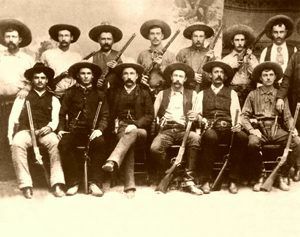 However, before the election even occurred, Royal along with his deputies, Barney Riggs, Camilio Terrazas, and John P. Meadows, were arrested by the Texas Rangers for conspiring to let Ochoa escape from the jailhouse. Complaints were also lodged directly against the sheriff for assault. Furious, the sheriff screamed that the arrest was a conspiracy by his political enemies. Royal retaliated by signing a complaint that charged Judge O.W. Williams, Jim and Morgan Livingston, and Shipton Parke with being involved in smuggling horses and mules from Mexico. The Texas Rangers then arrested these men as well, adding further fire to the already boiling political feud. But, all his tactics would be for naught. When the election rolled around in October, Royal lost to R.B. Neighbors. However, before he could finish his term of office, he would become a target. After adjourning court on November 21, 1894, Judge O.W. Williams went to the clerk’s office. While he was there, he heard a voice call “Royal” and then the muffled sounds of gunshots that came from the east door of the courthouse. Thinking that the sheriff had shot someone, he went into the hall, where he found a number of men loitering. Entering the sheriff’s office, he then found the soon to be ex-sheriff, A. J.Royal sitting at his desk with blood coming from his mouth and streaming onto the floor. There were six or seven buckshot holes in his left shoulder and neck area. Another man, who was in Royal’s office during the shooting, reported that he heard Royal’s name being called out but, could not identify the voice. He also stated that all that he had seen was the barrel of a shotgun thrust through the door and a glimpse of someone in dark clothes when the shot was fired. No one was ever arrested for the crime, which continues to be one of the biggest historical mysteries of the city. However, according to local lore, several prominent Fort Stockton businessmen drew straws to determine who would kill the controversial sheriff. Andrew Jackson Royal was buried in the old fort cemetery, where his grave remains today. His tombstone bears the inscription “assassinated,” a testament to this violent period in Fort Stockton’s history. 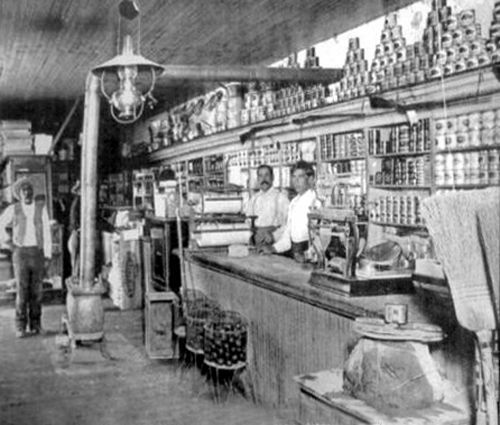 Koehler’s old store was bought by James Rooney and became the Rooney Mercantile Company. The desk where he was murdered is now housed in the Annie Riggs Memorial Museum and his bloodstains still remain in a drawer. The Gray Mule Saloon that the corrupt sheriff once operated continues to stand, now serving as a coffee shop and art gallery. Koehler’s old store and saloon later became and bank, and now serves as a small community hall. In the meantime, R. B. Neighbors would go on to fill the office of sheriff and would be re-elected for four additional terms. 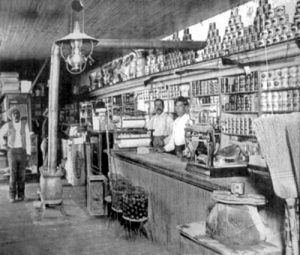 James Rooney, one of the men that Royal had tried to kill in Koehler’s old store and saloon, ended up buying the store, naming it the Rooney Mercantile Company, and becoming quite successful. He later also served as a vice president of the Fort Stockton State Bank. Royal’s deputy, the infamous gunfighter Barney Riggs, would continue to create chaos in the area for several years. In 1896, he killed William Earheart and John Denson at R.S. Johnson’s Saloon in Pecos, Texas. 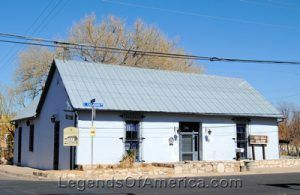 Today, the saloon is part of the West of the Pecos Museum and has a plaque on the floor designating the spot where William Earheart was killed. Later, however, karma would come back on Riggs when he was killed by his step-son-in-law in 1902. Riggs is buried in the same cemetery with his old partner, A.J. Royal. © Kathy Weiser/Legends of America, updated August 2017. 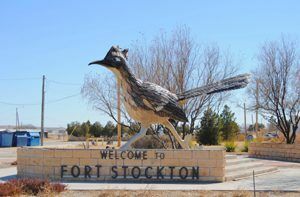 Paisano Pete welcomes you to Fort Stockton.